Pipelines crossing unstable terrain such as faults, swamps or landfills all suffer some degree of vulnerability to damage from ground motion. This motion can be either gradual or sudden, and places damaging shear and bending forces on pipelines. In areas close to, or within structures where differential movement can occur, pipelines should be restrained and supported to isolate and accommodate movement in a controllable manner at a designated location. Our products are available with both flange and mechanical joint end connections for adaptable protection for pipelines, pumps, bridge crossings, tank connections and many other critical installations, either above or below ground. Sizes of 3-inches through 24-inches are rated for 350 psi working water pressure. Sizes of 2”, 30”, and larger are rated for 250 psi working water pressure. 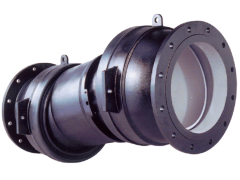 Our products are capable with ductile iron, conforming to all applicable requirements of ANSI/AWWA C153/A21.53 and FLEX-TENDS are totally protected from internal corrosion with a lining of fusion-bonded epoxy.